When it comes to your critical operations, a broken conveyor, out-of-order dock lift, or malfunctioning packaging machine can be critical and costly. 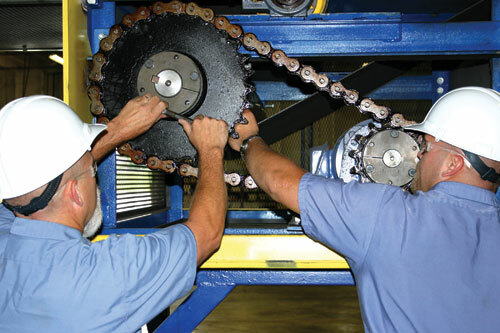 We have factory-trained technicians who help you keep your equipment running at peak efficiency and reduced downtime. We can help with repairs, service, and replacement parts for a wide variety of equipment, ranging from conveyors and lifts to vertical carousels and dock equipment. We execute electrical work, mechanical services, and other types of specialized work. Contact us today for assistance. Our structured maintenance programs help prevent breakdowns and alert you to potential issues in advance. Call our us for a consultation and thorough breakdown of your needs. When your equipment is down, it’s critical to have a reliable partner. We help companies repair defective equipment fast—we’re on call 24/7, 365 days a year for our service clients. We install a broad variety of material handling equipment—including conveyors, racks, shelving, mezzanines, modular buildings, carousels, security cages, and lifts, hoists or balancers. We do installations ranging from basic to complex. When you face a plant move, consolidation, or reconfiguration, contact us for fast assistance. We help companies work through this process with a minimum of downtime and other issues. Our San Antonio office serves south/central Texas. See our Dallas and Houston offices for more information. You can always contact any of our offices for fast assistance.